We are living in Forever. 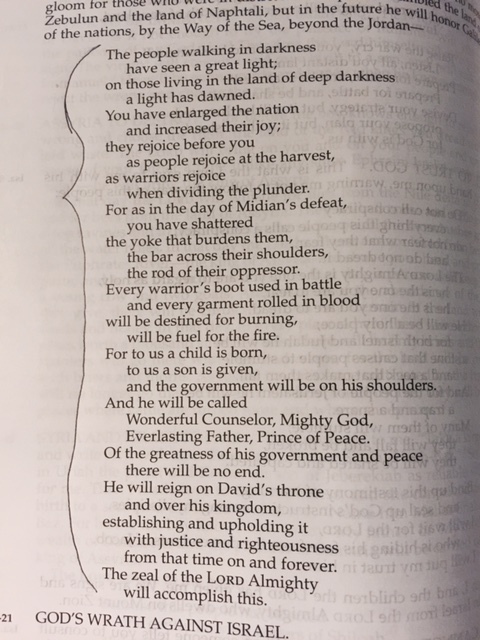 I love reading Isaiah as he prophesies about Jesus 700 years before Jesus was born. Unto us, God’s son was given. There is no end to the greatness of his governing of the world. There is no end to the peace he freely offers us. He reigns over his kingdom today. He established his kingdom with justice and righteousness. From now and on into Forever. Dear Father, We are your light for the people who are walking in darkness today. Please open their eyes to your light of love. Your light of joy. Your light of forgiveness. Your light of redemption and restoration. May your light shine out through us. Please help grow our faith and our witness so that your kingdom on earth will be enlarged. We know we are free when we accept the salvation that your son, Jesus, brought to earth. Help us share that freedom, dear Father. Shatter the yokes of sin that are holding our friends, family and neighbors captive. In the redeeming name of Jesus we pray, Amen. BibleEverlasting FatherfaithGod's Wordits a journeyJesus is Mighty GodpeacePrince of PeaceUnto us a child was born.